Week 4 was a disappointment, at least for divers in the West Maui area. The surfers were all grinning, though. A large south swell made diving visibility poor on July 22nd, dangerous on the 23rd (we didn't dive at all), and stupid on the 24th (we made two). Ironically, the turtles are smarter than us. For the most part they didn't show up at the Turtle House preferring to stay neatly tucked in their respective shelters. Thirteen of the turtles we have seen in previous years still haven't showed and this is the first week in which no former friends made their return. Of the missing, six have tumors so bad we don't really expect them at all. To get an idea of why we don't expect three of these animals, please read the biographies of 93-8D, 93-11, and 4-Spot. Two new fibropapilloma-related research papers are available. Authored by Drs. Lawrence H. Herbst and Paul A. Klein, ANALYSIS OF TUMORGENICITY AND DIFFERENTIAL GENE EXPRESSION IN FIBROBLAST CELL LINES DERIVED FROM NORMAL SKIN AND FIBROPAPILLOMAS OF THE GREEN TURTLE (CHELONIA MYDAS) , this research paper was released in June. 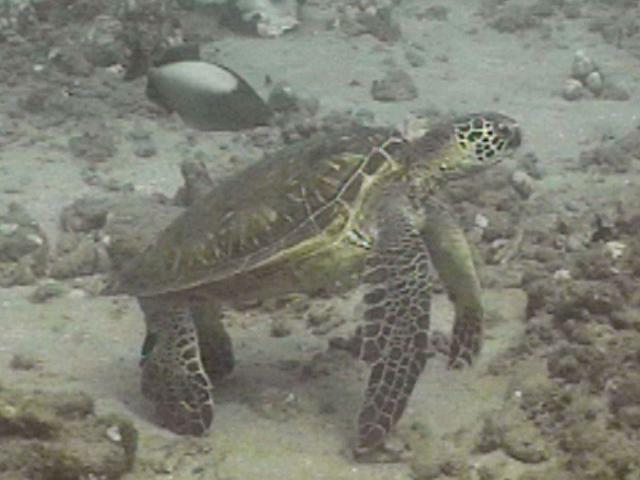 The other, MICROSCOPIC AND ULTRASTUCTURAL EVIDENCE OF A HERPESVIRUS-LIKE VIRUS IN HAWAIIAN GREEN TURTLE (CHELONIA MYDAS) WITH FIBROPAPILLOMATOSIS was just released in July, 1996. This administrative report was written by Drs. Alonso Aguirre and Terry R. Spraker. We will make the abstracts of both these reports available when time permits. This week we observed a very strange happening. Hoahele (Hawaiian for "fellow traveller") had the entire ocean floor to choose from when she needed a place to rest. She chose to land next to a triggerfish nest. For much of this week, the triggerfish has been fanning its nest. It has taken runs at us when we have gotten too close. Now it was Hoahele's turn. The trigger took turns fanning the eggs and then taking enthusiastic runs at Hoahele's face. Aside from making the turtle jerk its head occasionally, the trigger's attacks were rather ineffective. We didn't see any actual biting or contact. We watched fascinated for ten minutes before our air supply required us to leave. It was clear the only animal that was taking any of this seriously was the triggerfish. Turtle was blissfully ignoring fish. This week we observed several instances of crabbing and differences of opinions among the turtles. The one we present here is the most interesting because of the difference in size between the two turtles. The smallest turtle we have seen to date hovered and swam about and for whatever reason approached a larger turtle placidly resting on the bottom. The youngster approached with an attitude, opened its mouth and bit the other turtle's nose... but ever so briefly, then swooped away to ensure there'd be no reprisal. Then to add injury to insult, the little guy swiped its flipper along its cheek two times. This "swipe" is the turtle equivalent of a one finger salute. 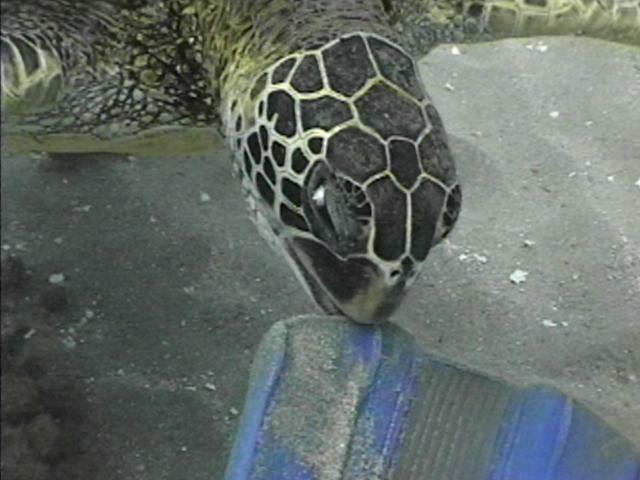 Green sea turtles are considered gentle vegetarians and they are. They do have a feisty side, though--especially the youngsters. Once they are convinced humans aren't a threat, they actually conclude they outrank humans! They will swim in your face and expect you to move. If you are resting in a place they covet, they expect you to move. In fact, they behave as if they know they have special threatened species status! It is as if they carry a copy of the Endangered Species Act tucked in their plastrons and are able to quote it verbatim. "I am a threatened species and YOU have to treat me accordingly--so move!" Here is Hoahele letting Peter know it's time to find a different piece of real estate. 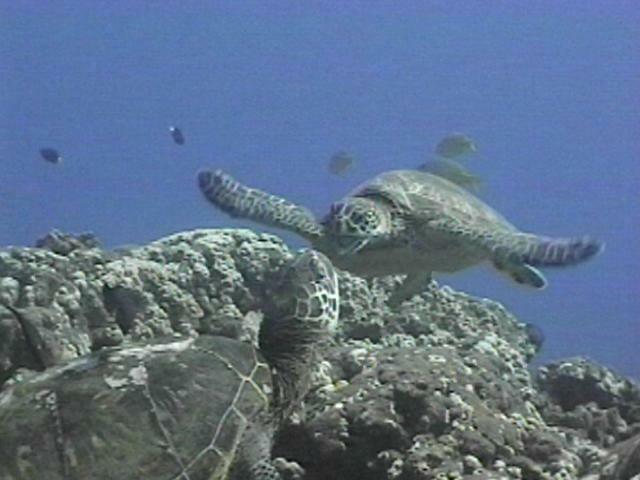 Turtles will nip each other's rear flippers to signal "move". How turtles know where to clamp down on a human is something worth pondering. It is worth noting that all three turtles in the above incidents have tumors.